Eco-Libris blog: My Green Resolution for 2009 - Madeline Kaplan, author of "Planet Green Gets Well"
My Green Resolution for 2009 - Madeline Kaplan, author of "Planet Green Gets Well"
How's 2009 going so far? we hope that so far, so good! Today we continue with our coverage of our partners' green resolution for 2009 and we have the pleasure to host Madeline Kaplan, the author of the children's book "Planet Earth Gets Well". Madeline Kaplan, is working now with Eco-Libris to make this green children's book even greener - a tree will be planted for every copy sold (with the exception of on-line sales). Buyers will also receive our sticker with their book, saying "One tree planted for this book". Hello Madeline. 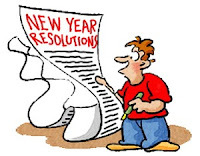 What is your green resolution for 2009? I hope to be able to wear more green clothing, made from natural fabrics. More and more green designers are making clothing that is both affordable and attractive and that makes it easier to make a conscious choice about sustaining the environment on a daily basis. I've also resolved to encourage the young parents that I know to purchase green children's clothes as a way of taking the ideas I've put forth in my children's book, "Planet Earth Gets Well" (www.planetearthgetswell.com) into a very real commitment to making the world a better place for our children. What's your green wish for 2009? My green wish for 2009 is that there be a significant increase in worldwide awareness of what living in a green world can be. I am hopeful that momentum will continue to build and that industry will realize that part of the solution to our ailing economy is to rethink and to "re-green". Other greetings for the New Year? I wish everyone on the planet peace. That alone would bring untold hope to a dispirited world. Any other plans for 2009 you would like to share with our readers? My plans for 2009 is to continue to promote "Planet Earth Gets Well" in schools around the country. I cherish the belief that "a child shall lead us" into a more sustainable world. I look forward to an ongoing partnership with Eco-Libris and the fine work that it does in the green-publishing world. My books wear the Eco-Libris label with pride. 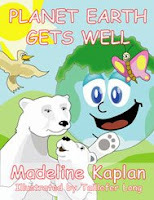 "Planet Earth Gets Well" by Madeline Kaplan, illustrated by Taillefer Long, addresses environmental concerns in a child-friendly format, based on the author’s awareness that future generations must be prepared to preserve their planet and its resources. The story (reading level - ages 4-8): When Planet Earth gets the sniffles, Mother Nature challenges each of us to retract our gluttonous ways. She instructs the Planet Earth to take better care of himself which means all humans must make big changes about key issues like global warming, the melting of polar ice caps, deforestation and energy depletion. Once Planet Earth sneezes, Mother Nature listens and helps each and every one of us learn how to be good to our dear, old friend. This educational reader is wholly unique in the ways that matter-think globally, think green, and act accordingly. And you can watch Madeline Kaplan speaking on the book on Fox61. We'll keep bringing you almost every day this month new green resolutions for 2009 so stay tuned!